I put the question to one of my history survey classes. Forty-two students, mostly sophomores, sat in front of me, staring into empty space. Perhaps I asked the wrong question? Maybe I should ask who won the Super Bowl fifty years ago. No doubt then their zombie-like faces would suddenly come to life. A lively discussion would ensue, as different answers came from all across the lecture hall. I was not surprised by the response to my question. The appalling lack of knowledge about our nation’s history, any sense of historical time, not to mention a profound ignorance of geography, is not surprising to those of us who choose to teach college and university students. I am no longer surprised to discover that many of my students can only read at an elementary level. Nor am I surprised to learn that some are unable to read or write, at all. I do not remember where I was, or what I was doing, when I first heard that President Kennedy had been assassinated in Dallas, Texas. I was a freshman in college. Classes were canceled. Many of us gathered in the library to hear a young history professor give an impromptu eulogy. By the time he finished, he was almost in tears. We were all silent, aware that we would never forget what happened on that day in Dallas. John F. Kennedy’s assassination marked the end of idealism and hope of a better future for many of us who wanted to believe that human beings were by nature good and reasonable. That day darkness descended on Camelot. Before the decade ended, both Robert Kennedy and Martin Luther King, Jr. would also be assassinated. 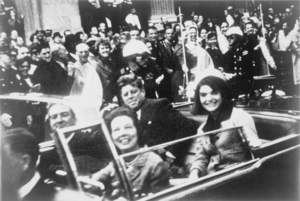 John F. Kennedy was not the only public figure to die on November 22, 1963. Both C. S. Lewis, the lord of Narnia, and Aldous Huxley, author of Brave New World, died that day, their deaths overshadowed by President Kennedy’s. The number one hit song on November 22, 1963, was “I’m Leaving It All Up to You,” written by Robert Dale Houston and recorded by Dale and Grace. Houston was standing along the parade route and waved to the President just moments before the fatal shots were fired. J.F.K. : The Man and the Myth by Victor Lasky was at the top The New York Times Best Seller List for non-fiction. It was a scathing critic of J.F.K. and the whole Camelot myth. The book was quickly pulled, only to reappear three years later more damning than at first. I don’t remember where I was, or what I was doing, when I first heard that President Kennedy was dead. I do remember, however, that I was on Interstate 79 passing through Wheeling, West Virginia, when I heard over the car radio that Elvis Presley had just been rushed to a hospital in Memphis, Tennessee. Funny what one remembers, isn’t it?